Stunning large piece of Lladro produced in 1978 and retired in 2005. This is a lovely piece, standing at 11 tall and 12.25'' wide. In excellent condition with wooden base. Please zoom in on the photos on this as they form part of the description. 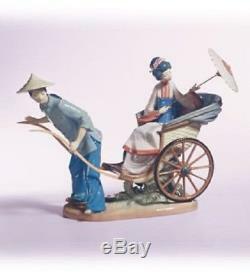 The item "Lladro A Rickshaw Ride. 12.25'' wide" is in sale since Monday, November 5, 2018. This item is in the category "Pottery, Porcelain & Glass\Porcelain/China\Lladro/ Nao\Figures". The seller is "mycollectibles-1" and is located in Lewes. This item can be shipped to United Kingdom.